The See America First movement began in 1906 with the aim of protecting and promoting the landscapes of the American West. In 1908, Gifford Pinchot and President Theodore Roosevelt hosted the White House Conservation Conference to promote the wise use of natural resources for generations of Americans. In 1912, Pittsburgh’s smoke investigationcondemned the effects of coal smoke on the city’s environment. In World War II, a massive propaganda effort mobilized millions of Americans to plant victory gardens to save resources for the war abroad. While these may not seem like crucial moments for the American environmental movement, this new history of American environmentalism shows that they are linked by patriotism. 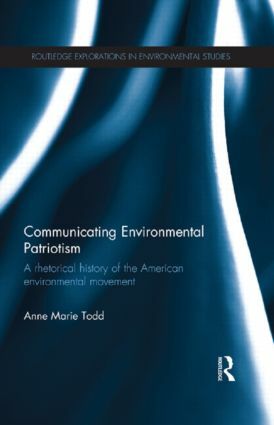 The book offers a provoking critique of environmentalists’ communication strategies and suggests patriotism as a persuasive hook for new ways to make environmental issues a national priority. This original research should be of interest to scholars of environmental communication, environmental history, American history and environmental philosophy.